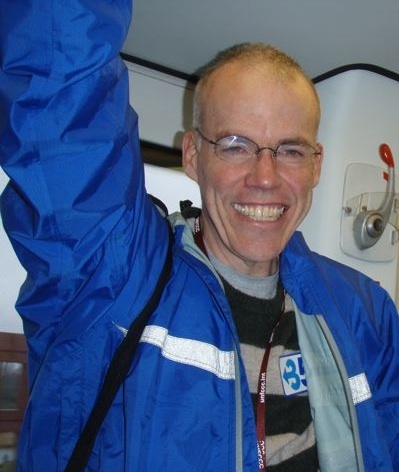 Bill McKibben is a U.S. writer, environmentalist and the founder of 350.org, an international climate campaign. His first book, “The End of Nature”, was published in 1989 and is regarded as the first book written for a general audience about climate change. 350.org is credited with organising the most widespread political action in history when more than 5,200 public demonstrations were held on Oct. 24 in 181 countries. The organisation’s goal is to raise public awareness about the dangers of climate change and the need to return carbon concentrations in the atmosphere to 350 parts per million (ppm). Currently, concentrations are 387 ppm and increasing at 2.0 to 3.0 ppm per year. Recent science suggests that a maximum of 350 ppm may be what is needed to keep overall global temperatures below 2.0 degrees C.
TERRAVIVA: Why are you here? BILL MCKIBBEN: I wrote a book on climate change 20 years ago and you could say I’m just following the trail to its end. We’ve also brought 350 young people from all over the world to make sure negotiators hear their voice and insert a little reality into an unreal situation. TV: What needs to happen in Copenhagen? BM: Science has already told us what we need to do: reduce CO2 [carbon dioxide] concentrations to 350 (ppm). There should be real urgency here, this is not just another problem and it’s happening right now. TV: Negotiators here talk about what is politically feasible, not about the science. BM: Few people here realise the extent and urgency of the climate crisis. They treat it as one more negotiating game. Tiny countries like Tuvalu are leading the world and speaking from the basis of climate science. It’s embarrassing that the poorest countries understand the science and are leading the way. We have to move the “political reality” to the scientific reality. There is no mystery which will win in the end. The goal for humanity is to keep the global temperature from rising much further. TV: You covered the final negotiations for the Kyoto Protocol in 1997. How is this different? BM: It’s more complicated because countries like China, Brazil and India are no longer poor developing countries and are more interested in maintaining economic growth. TV: Are you disappointed with the U.S. position and President Obama? BM: I worked hard to help Obama get elected. While Obama has moved on climate, the physics of carbon in the atmosphere is unlikely to be impressed with U.S. proposals. God knows how Obama officials can walk in here with a straight face after approving construction of a new pipeline to bring Alberta sludge – oil from Alberta’s tar sands – into the U.S. The tar sands project is the most environmentally damaging on the entire planet. TV: Were you surprised that Australia, which is suffering badly from drought, heat waves and brush fires, recently failed to pass legislation to reduce its emissions? BM: That speaks directly to the power of the coal industry there. The fossil fuel industry has a vested interest in the status quo and they are the most powerful force in the world. TV: How do we deal with our fossil fuel addiction? BM: The easiest thing to do is raise the price of fossil fuels. If that had been done decades ago in the U.S., it would look more like Denmark with its excellent public transport system, bicycle networks, low-energy buildings and reliance on low-carbon energy sources. It would have also shifted our thinking and habits towards being and working together. TV: What will you do after Copenhagen? BM: We will continue to build a global movement to push governments out of their comfort zones to take the actions that the science dictates. But first I’ll go home and sleep for a month.